Eliminates the symptoms of "brain fog"
Scitec Mental Focus is an advanced booster of psychophysical efficiency. The supplement consists three natural substances: anhydrous caffeine, acetylcarnitine and tyrosine. The product is recommended before demanding intellectual concentration and mental work, but will also succeed before heavy workouts. It has a numerous advantages: a stimulating effect, reduction in sleepiness and fatigue, increase in the efficiency of the body, positive effect on memory and the ability to concentrate. Acetyl L-carnitine (ALC, ALCAR) is an organic chemical compound belonging to the so-called vitamins. Chemically, it is the acetyl ester of the L-carnitine amino acid. When compared with other forms, carnitine has a much greater ability to overcome the blood-brain barrier and a stronger effect on the nervous system. ALC is one of the most efficient promoters of acetylcholine synthesis and that is why it has an enormous role in enhancing memory and increasing mental efficiency. It also affects the concentration of key neurotransmitters, such as serotonin, dopamine or noradrenaline. This translates into a better mood, motivation and willingness to make any actions. It also reduces the feeling of chronic fatigue and discouragement. ALC also has a number of health-promoting properties that are important for maintaining optimal mental performance and preventing neurodegenerative diseases. The researches have proven that it reduces oxidative stress within the brain, protects neurons from damage caused by excess of free radicals or the accumulation of toxic heavy metals. Tyrosine is one of the amphoteric amino acids synthesized in the body from phenylalanine in small amounts. It acts as a substrate for the production of catecholamines such as dopamine, adrenaline and norepinephrine. The excessive physical or intellectual effort significantly reduces their level, which is partly responsible for the feeling of overtraining as well as of mental and physical fatigue. Tyrosine helps restore the proper level of neurotransmitters, and thus helps to improve psychophysical efficiency. Clinical studies indicate that tyrosine works best in case of prolonged tension and stress (psychosocial, physical), which usually adversely affects mental condition and intellectual performance. Its effects on the body were tested in quite extreme conditions – the participants of the studies were solving complex tests of cognitive abilities after a sleepless night or extremely heavy trainings in low temperature and rain. The tyrosine supplementation achieved surprisingly good results, much better than these of the placebo-controlled group. Tyrosine works well in combination with caffeine, which is also included in the composition of the product. In simple terms, when caffeine releases catecholamines, tyrosine makes sure that they do not run out too quickly. As a result, we get a solid dose of long-lasting energy. Anhydrous caffeine is called pure caffeine. It is extracted from plants such as coffee or yerba mate, but it is not composed of any other active substances. Researchers postulate that chlorogenic acids present in coffee may impair the ergogenic effects of caffeine, which is why it seems that anhydrous caffeine will work faster and more efficiently. Structurally, it is similar to adenosine, which is why its receptors are easily attached. This results in stimulation of the nervous system and the increase in production of neurotransmitters such as epinephrine, norepinephrine, dopamine, or even acetylcholine. As a result, the feeling of tiredness or fatigue disappears and you may observe the increase in the level of energy, the speed of reaction, vigilance and clarity of mind. Therefore, physical or intellectual effort is easier to achieve and the ability to concentrate on the task is also improved. 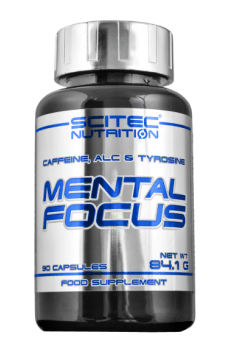 To sum up, Scitec Mental Focus is a formula that will be particularly useful during periods of intense physical effort or intensive intellectual work. The preparation is recommended to people suffering from the lack of energy, distraction, trouble with memory and concentration. The supplement is based on three natural compounds with clinically proven efficacy. Take 1 capsule 30 minutes before increased intellectual or physical activity. If necessary, increase the dose to 2-3 capsules. The best time to take the supplement is just before the planned intellectual or physical effort. The product can also be taken in the morning in order to achieve the right stimulation, motivation and energy for action. Because of the high content of pure caffeine, it should not be combined with other stimulants or other sources of caffeine. You should remember that if taken in the evening, it can disrupt sleep and make it difficult to fall asleep. Bovine Gelatin, Anti-Caking Agent (Magnesium Stearate), Colors (Titanium Dioxide, Black Iron Oxide, Brilliant Black BN).